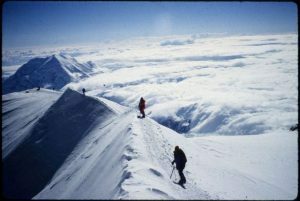 Taniguchi and another climber walking the ridgeline of Denali. Photo courtesy Stacy Taniguchi. For safety, they tethered themselves together with a 50-foot rope. Snowy conditions were nearly blinding their progress, and the upper crust of snow, usually frozen solid on the glacier, was giving way in unseasonably warm weather. On almost every step, Taniguchi sunk through to his knees. And then—terrifyingly—to his armpits. “My feet dangled over a gaping crevasse I couldn’t see the bottom of,” Taniguchi says. Clutching the snowy cliff, he maneuvered out, cautioning his client, Dennis Gum, to make a wide berth. Not a few minutes on, Taniguchi was jerked flat on his back, sliding backward. Gum had not circumvented the pit and, in free fall, was dragging Taniguchi to the same fate. With less than 10 feet to spare, Taniguchi snagged the ax from his pack and slammed it into the glacier, halting their progress. He managed to strengthen the anchor and free himself, but Gum’s life literally hung in the balance. “I was calling desperately on the CB radio for help, but no one answered,” says Taniguchi. Unable to hoist out Gum, 80 pounds heavier, Taniguchi began boiling ice into water, lowering it in a thermos for Gum to drink, trying to keep his core body temperature up. Four hours passed. Gum’s speech slurred as he nodded in and out of consciousness, perishing before Taniguchi’s eyes. “I prayed like I couldn’t have been more serious about anything—wanting something, needing something—in my life,” says Taniguchi, who describes himself as a lukewarm member of the Church up to that point. In the face of death, he surrendered everything. Taniguchi fell to his knees, screaming into the whiteout. Suddenly, a reply on the radio. A ranger heard the Mayday and called a rescue helicopter. The pilot, Taniguchi would later learn, was a Latter-day Saint who that morning had driven toward Anchorage to attend sacrament meeting—his first in a month because he’d been on call. But 20 miles out, he got the distinct impression to turn around. 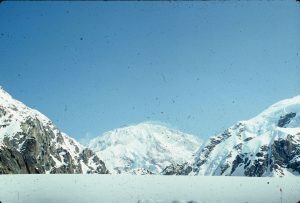 Stacy Taniguchi has a collection of slide photographs from his 30-plus Denali attempts. Photo courtesy Stacy Taniguchi. “I am convinced to this day, until I die, that God answered my prayer,” says Taniguchi. They got the hypothermic Gum out, into a sleeping bag surrounded by hot-water bottles, and to the hospital. He recovered in time for his wedding, which Taniguchi happily attended. The Dicksons decided to take a long walk—from Georgia to Maine.